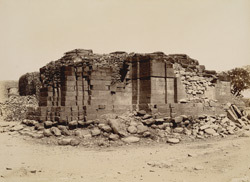 Photograph of an old temple at Segaon in the Sholapur District of Maharashtra, taken by Henry Cousens in 1897-98. Cousens wrotes: "...an old temple, partly in ruins...which, from the manner in which the walls have given way, disclosing the interior structure of the same, serves as an excellent example showing how the walls of these buildings were erected. In the photograph the outer and inner casings or shells, each with one face dressed and the inner rough, are distinctly seen and the dry boulder filling in reveals itself. It will be seen from the photograph...that there is practically no bonding between the inner and outer faces of the walls, which owe their stability to the weight of the blocks composing them. The filling in is thus always tending to burst the walls asunder, and so we often find that ruin to these old shrines is generally in this direction, in fact, many an interior stands intact where, from within, one would hardly imagine the building at all damaged, whereas outside the walls have been entirely stript of their outer shells and the filling in has rolled away". ('Progress Report of the Archaeological Survey of Western India, for the year ending 30th June 1898', pp. 4-5).